Bitcoin miners play an extremely important role in the Bitcoin network. Without miners, there would be no new bitcoins, and no transactions would be confirmed. Bitcoin (and other crypto) miners are so important to the Bitcoin ecosystem that they are justly rewarded with bitcoins for their hard work. However, bitcoin mining is not as profitable as it seems. When Bitcoin was still in its infancy, miners were getting paid 50 bitcoins for every block mined. But every 210,000 blocks (this is around 4 years), the reward is halved. So this means that the initial 50 bitcoins was halved into 25 bitcoins. And now, at this particular point in time, the block reward is down to 12.5 bitcoins. If you consider the price for one bitcoin right now (well over $15,000), this is still is a very attractive reward indeed. And experts predict the price will continue to go up as the number of bitcoins in existence slowly go up, too, and the demand for more bitcoins continue to increase. Mining bitcoins is not an easy job, much like any other physical mining job in the real world. 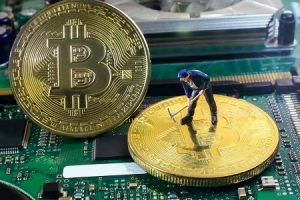 Bitcoin miners may not get dirty from soot and mud, but their powerful computers do. The difficulty in mining new blocks has gone up so much that individual miners are finding it extremely difficult to solve complex cryptographic functions on their own. Many different miners or mining groups compete to discover a new block and the mining difficulty are at extremely high levels now. Most, if not all, miners are forced to work in mining pools where several miners work together as a group to add new transactions to the blockchain. When a new block is mined, the reward is split according to the work each miner’s computer has done. Mining bitcoins doesn’t come cheap. You can’t just use any computer as solving cryptographic functions will take so much of your computer’s processing power. Not even a high-end laptop or desktop computer can do the job anymore – it’s really that difficult to mine new bitcoin blocks today! Even if you join mining pools, you’ll need to invest a lot of money to buy the right hardware. In the beginning, a powerful CPU (Computer Processing Unit) and GPU (Graphical Processing Unit) were sufficient to mine new blocks. However, as the difficulty of mining bitcoins have gone up, more processing power was needed. Today, an ASIC (Application Specific Integrated Circuit) chip is seen as the only way to succeed in mining. A bitcoin-mining ASIC chip is designed specifically to mine bitcoins. It can’t do any other task apart from mining bitcoins. While this may be viewed as a downside for some, remember that mining is a hard job. You need all the resources you can use to find the next transaction block so you can add it to the blockchain and get rewarded bitcoins in the process. Professional miners find this hardware very powerful than other technologies used in the past. Also, it’s not as power hungry as other hardware out there. It will still consume plenty of power, however, so consider that if you’re worried about your electricity bills. If you are prepared to buy the technology to mine bitcoins as well as pay more costly power bills, then mining bitcoins will be a great way for you to acquire this particular cryptocurrency. However, we’d like to say that this is not a job for the uninitiated. It’s best to leave this task to the experts or those with an in-depth knowledge of how bitcoin mining works. As we’ve shown you in this guide, there are many ways you can acquire bitcoins that don’t require a healthy investment of both time and money.